In case you were wondering, I am still alive 🙂 I have been posting over at my original blog – nutritionhealthlife.wordpress.com. I’ve decided that while I like the idea of having all of my recipes in one place, separate from other posts, it is too time consuming to go back and forth. With that, I am going to stop posting here and will be over at nutritionhealthlife.wordpress.com if you want to stop over! These muffins are so d.e.l.i.c.i.o.u.s. and only contain a few simple ingredients. Plus they are low-fat and flour-free, so they are a great snack or breakfast for people with celiac disease, gluten intolerance, heart disease, high cholesterol, diabetes, and well, anyone! I should call they lazy day muffins, because they are so easy to make. You don’t have to mix anything yourself and you only have to clean 2 things when you are done – a food processor and a muffin tin. I am pretty sure they took 10 minutes from start to oven. The recipe is a modification from “Keeping up with the Joneses” blog. I made their original recipe last week – it turned out ok but I knew it needed some tweaking. This version turned out perfect, so give it a try! Preheat oven to 350F and spray a muffin tin with cooking spray. Place oats in a food processor and pulse until they are very fine chunks – not quite flour, but very small pieces. Add the baking powder, baking soda, and sugar. Pulse a few times to mix. Add the remaining ingredients and then let the food processor do the rest of the work! Process until well blended. Fill the muffin tins nearly full with batter. Bake for 20-25 minutes, or until the top and edges are lightly browned (I did 25 minutes). 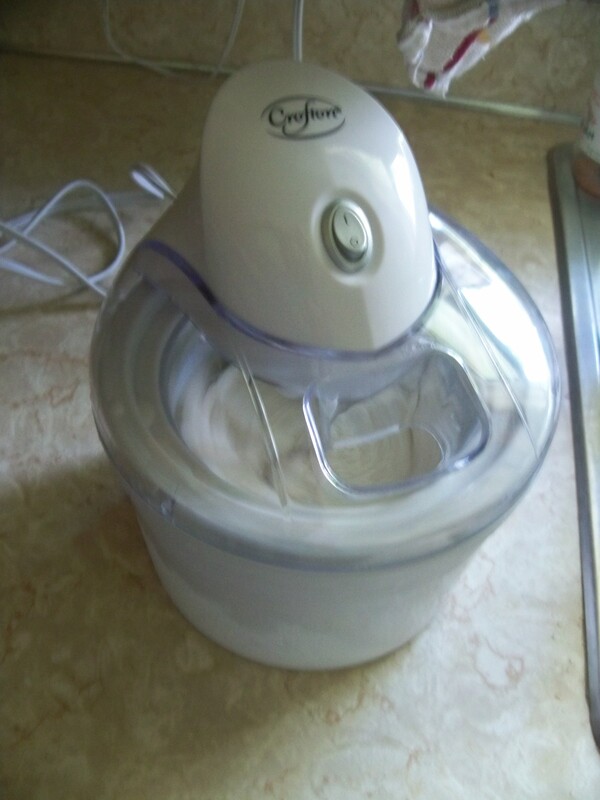 The day after I posted about purchasing an ice cream maker I spent a few hours in the kitchen trying to come up with the perfect recipe. I had read that using low-fat options, like skim milk, made the ice cream more ice than cream. I had read of some success people had with 2% milk and half-and-half, so I I thought I would start there. Instead of 2% milk I wanted to try Vanilla Almond Milk – the fat content is about the same, but the calories in almond milk are almost 1/2 AND the almond milk already had the vanilla flavoring and sugar, saving even more. The half-and-half was just because it is hard for me to purchase real cream (that will have to change). So I began my simple recipe of 2 ingredients. I removed the bowl from the freezer and put the lid on to star the machine. The directions said it should be running when you add ingredients to prevent sticking. 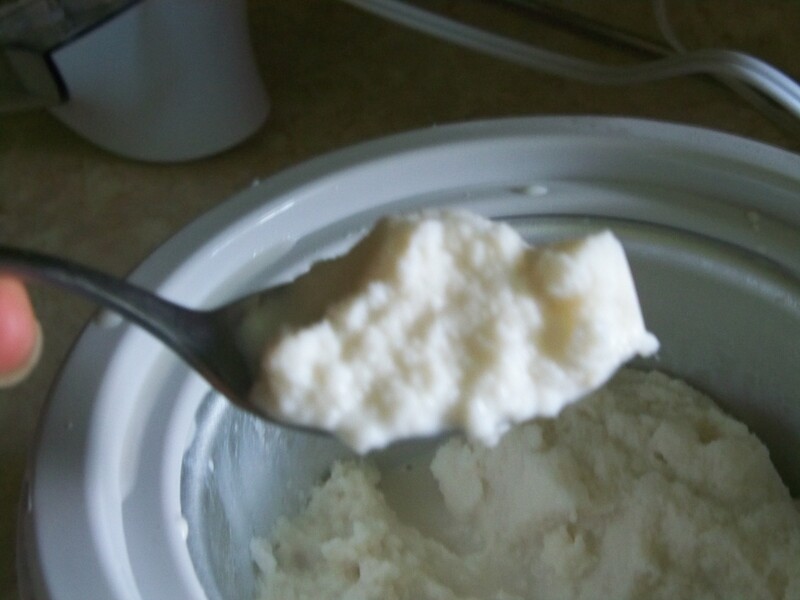 I added about 1 1/2 cups of almond milk and 1/2 cup of cream to my running ice cream maker. As you can see from the picture the “ice cream” was more like ice milk. It had vanilla flavor but was not creamy. I was disappointed, but not defeated. We had tried banana ice cream in the food processor a few weeks ago and I remembered how thick and creamy the banana dessert was. 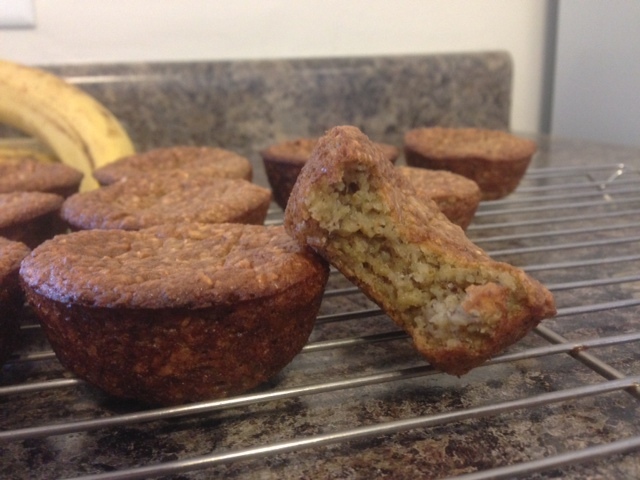 We had a few ripe bananas on the counter, so I grabbed two, mashed them up and added them to the mix. I let it run for another 20 minutes. The mixture was creamier but also runnier since the bananas hadn’t been frozen. Pretty nice, huh? 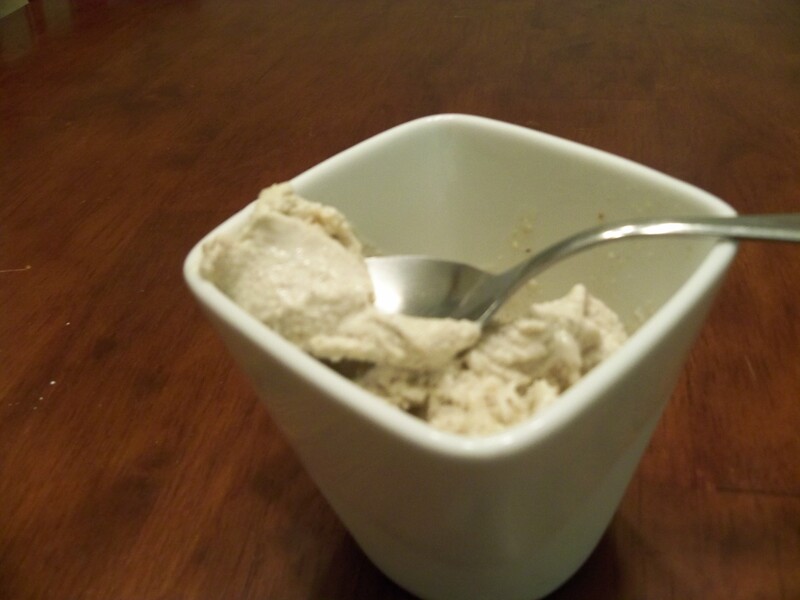 The texture and taste were just like ice cream but not as sweet, so we both felt satisfied after our serving. I was quite pleased for my first attempt. The walnut pieces were still pretty big, so if I did this again I would first blend the walnuts into a walnut butter and then add the cream mixture. You could also use peanut butter instead. I will cotninue to experiment and be back with more recipes (possibly some that include real cream).